Should you water your tomato plants? When? How–and how much? Books and articles often advise to water when the soil feels dry—so plants get at least an inch of water a week—and when you water, water deeply and try to avoid splashing soil onto tomato leaves because soil may contains disease organisms that will attack your plants. But what does that mean when you step into your Tomato Patch? Just what does “dry” feel like—if your soil is basically sand, clay, or loam? How do you measure “one inch” of water a week—by setting an empty Campbell’s soup can in the middle of your patch so you can measure rainfall? 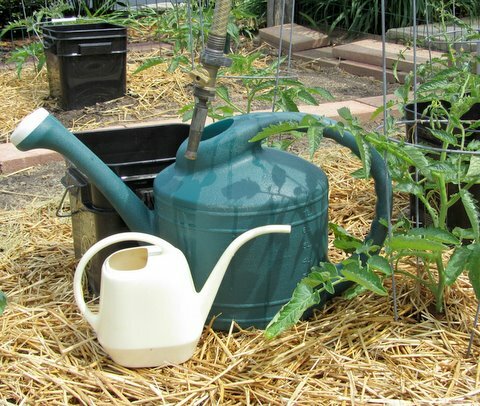 Should you use a watering can, a hose, a soaker hose, or a drip-irrigation system? Michelle B.: I use a soaker hose in my bed of 20 plants. If we don’t get enough rain, I let the hose run for about 30 minutes every two to three days, depending on the weather. I measured the output of the hose to calculate how long to run them to get about an inch a week. 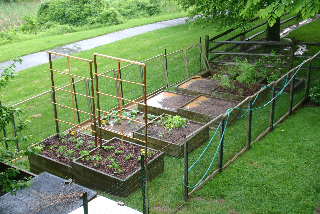 Ed B.: I am using the Square Foot Gardening method—one tomato vine per square foot, with trellis. I use a hose from a rain barrel and give each plant a drink. Kathy R.: I use a watering can and apply the water around the root system until my plants have become established or there is a “rain deficit.” I plan to put in drip irrigation next year. Natalie B.: I just use a watering can or hose. I try to be careful not to splash any soil up and also careful not to wet the foliage. No special watering arrangements here! Pat F.: I put the hose in my raised bed about once a week and soak the soil. I try not to wet the foliage at all. Leslie G.: I plant my tomatoes very deep, and they root along the stem. The deep planting means that they’re less susceptible to water stress and consequently less susceptible to blossom-end rot. I lay leaky hose under them when I plant and then mulch, usually with straw, or leaves if I have leftovers. I water deeply once a week unless we have rain. This works for me. Holly M.: I’m a lazy gardener with limited time. I have raised veggie beds outside my kitchen door because I’m trying to hide my plants from four-legged critters. Whenever I have time, I either pull a hose to the individual plant’s base and slowly soak water in and move the hose around or I stand there and water with my water wand from the topside. It’s a great way to enjoy a morning cup of coffee! But the truth is that I water whenever I am here and the beds seem dry, so my watering is not always in the morning. Raised beds have advantages, but they dry out more quickly. I top mine with lots of compost, so splashing contaminants from soil onto plants hasn’t been a problem. Barbara W.: I mostly let nature do my watering. However if we are hot and dry, I water with a hose at the base of the plant. By the way I am expecting to pick my first Early Girl in about a week. Jane H.: I recently read that tomatoes do not like cold water, so this year I’m setting up a rain barrel in my vegetable garden. I will have to fill it from the hose, but will let the water warm and then use it on the tomatoes. It’s been such an outstanding year for the vegetable garden so far this year that it may be hard to tell if the warm water will make a difference. 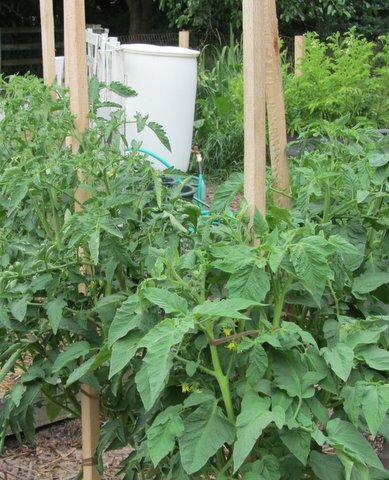 Gayle H.: I use a drip irrigation system. I have 1/2″ main line with a timer and a 1/4″ Raindrip Drip-A-Long and a 1/4″ soaker hose. I bought parts at Lowe’s and Sun Nurseries and from catalogs and online sources. I put landscape cloth over the drip-irrigation system to help prevent evaporation. My 1/4″ Drip-A-Long type puts out 1/2 gallon per hour. However, since I also have a soaker hose and don’t know how much it puts out per hour, I just water first for 30 minutes, and if I feel that’s not enough, I use the timer’s manual function and give my plants what I think they need. I usually water every three days. You can get kits that have all that is needed. Bob N.: I hose water into each of my drip-irrigation buckets for two minutes when I think my plants need water. To help determine that, I keep an eye on a nearby bird bath. When it contains rain water, I don’t water my plants. When it’s dry, I water my plants every morning—nine buckets for 23 plants in about 20 minutes. The buckets and straw mulch minimize splashing soil that can cause diseases and help conserve water in the soil. There you have it: Ten gardeners with ten different ways to water their tomato plants. They have developed a “feel” about how much watering they need to do to reach the “ideal” one-inch of water per week. There are so many variables that they don’t have a one-way-fits-all watering rule. Should you water your tomato plants? Keep an eye on them and give them a drink when you think they need it. Since I didn't send in a picture and comment when Bob asked last week, I'll comment now. This year's tomato bed is 4 by 70 feet with 18 tomato plants in a line four feet apart. The bed is drip irrigated with four rows of Bowsmith Bigfoot drip tape with an eight inch emitter spacing. This drip tape emits .53 gallons per minute per 100 foot of tape. with 280 feet of tape on the bed, the system will emit 89 gallons of water an hour. Since the bed is 280 square feet, it requires 174 gallons of water a week (an inch of water on one sq. ft. = .62 gal. x 280 = 173 gals.) Thus this bed gets watered for two hours each week. Also, if anyone wants to set up a drip irrigation system, contact me at kent.a.phillips@gmail.com and I try to give you some help. Like Ed B. mentioned in the article, I too use the Square Foot Gardening method. Since we don't use existing soil (we mix 1/3 coarse vermiculite, 1/3 peat moss & 1/3 BLENDED compost). We can easily tell if our mix is dry or not. While I'm on vacation, I've set up a drip hose so my son can more easily tend the tomatoes (12 San Marzanos & a lot of different varieties). We started a drip irrigation system this year. We turn it on for a total of 2 hours per week.